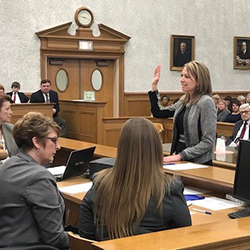 Nearly a decade after graduating from the Duquesne University School of Law, Katie Charlton, L'08, is the first female ever elected as district attorney in Armstrong County, Pennsylvania. Prior to her election, Katie and her husband, Joseph, had been in private practice together since 2011 at Charlton & Charlton, Inc., Attorneys at Law, in Sarver, Pa. As a successful criminal defense attorney, Katie defended cases in numerous counties, including Butler, Armstrong, Allegheny, and Mercer counties in Pennsylvania. She has practiced in the area of civil litigation, personal injury litigation and employment discrimination on both a state and federal level. In January 2018, she was sworn into office, offering experience as a part-time district attorney that included a 2016 homicide case. She said she has always been interested in prosecuting homicide cases and also wants to focus on sentences for drug users. "Offering them a way to get through the criminal justice system and get help on the other end," Katie said of her ultimate goal, while reducing recidivism and generally benefitting the community. The resident of Freeport, Pa., plans to create an official drug court, designed to place individuals who are facing drug charges or have been convicted of drug charges into an intensive drug treatment program as an alternative to jail to aid in their recovery from drug addiction and help them maintain clean and sober lifestyles. "I really prepared myself for what I envisioned myself doing," she said. "I had a vision and I learned at Duquesne from some of the best people who had trial work experience. Duquesne Law School is so beneficial," she said. Katie received her bachelor's degree from New York University.